Attorney Perlberg Named a New 2016 “Top 100 Trial Lawyer” | Hupy and Abraham, S.C.
Hupy and Abraham, S.C. Attorney Thomas Perlberg has been selected to join the National Trial Lawyers: Top 100 Lawyer list. 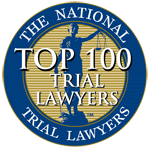 The Trial Lawyers Top 100 is an invitation-only organization composed of the most exemplary trial lawyers who meet a strict number of qualifications, exhibit extraordinary trial results and display leadership. Selection into the organization requires a multiple-stage process and grants access to an elite group of litigators. This prestigious honor has been restricted to new invitations as of 2016. Each position is highly sought after due to its exclusivity. Attorney Perlberg has the required skills, knowledge and proficiency in the law. In 2016, Attorney Perlberg received a 10 Best Client Satisfaction Award from the American Institute of Personal Injury Attorneys. Attorney Perlberg has been practicing with Hupy and Abraham, S.C. since 2010 and is licensed to practice law in Wisconsin and the United States District Courts for the Eastern and Western Districts of Wisconsin. Attorney Perlberg joins Michael Hupy, Jason Abraham, Brandon Derry, Robert Domol, Todd Korb, Chad Kreblin, Timothy Schelwat and Thomas Kyle, who are also members of the Top 100 Trial Lawyers. Hupy and Abraham, S.C. attorneys comprise over 10 percent of the top lawyers honored.